This Friday, June 20th, 6:30pm — Come to the Center for Book Arts’ Artist Talk, moderated by Jennifer Tobias, featuring current exhibiting artists Ellen Harvey, Reynard Loki (MomenTech), Emilio Chapela Pérez, Lisa Schilling, and exhibition curator Rachel Gugelberger. Borrowing its title from the stock opening and closing phrases of traditional oral narratives, in particular fairy tales, the exhibition Once Upon a Time, There Was the End pivots around two central themes: stories elicited by modalities of the book in the face of rapid technological transformation, and anxiety about the end of the book as echoed in apocalyptic, dystopian and speculative visions. The exhibition presents the work of eleven artists who employ conceptual strategies and material forms that consider the dematerialization of the book; the interplay between physical and digital; and irreducible form(s) in books, works on paper, photography, video, sculpture, performance and Web-based projects. Ellen Harvey‘s work has been exhibited at the Whitney Museum of American Art, Sculpture Center, Bass Museum, Turner Contemporary, and Wave Hill, to name a few. She has completed public commissions in Chicago, the Bronx, Las Vegas, Brooklyn, and Andover in the States, and in Amelbergakerk, Bossuit, in Belgium. Her work is included in the collection of the Whitney Museum of American Art, Fidelity Investments, Hammer Museum, Rema Hort Mann Foundation, Neuberger & Berman, The Progressive Collection, Queens Museum of Art, West Collection, and Gwangju Art Museum. Harvey lives and works in Brooklyn, New York. Created specifically for the exhibition, Looking-Glass iPad, Looking-Glass Kindle, Looking-Glass Nook consists of three drawings of the first page of Lewis Carroll”s 1871 novel Through the Looking Glass, and What Alice Found There laser-etched onto Plexiglas mirrors fashioned after the back side of e-readers. The mirrored surfaces invoke Carroll’s fairy-tale world of opposites told through the reflections of a looking glass, where backwards-written text is made legible by reading it in a mirror, which also acts as a portal into Alice’s Wonderland. In Harvey’s looking glasses, however, the back of the mirror is impenetrable: The mirror text from page one of Through the Looking Glass is fixed and static on its surface, denying the reader access to the rest of the text. Reynard Loki is part of an experimental production studio, MomenTech, an experimental production studio based in New York City. With instructional works, public interventions, user-generated content (UCG) and user-assisted content (UAC), MomenTech provides innovative solutions to leaders, teachers, curators, producers, directors and organizers looking for new ways to engage the public on the fundamental, practical and theoretical questions encountered at the intersection of education, politics, science, technology, arts, culture, religion and sports. P.U.L.S.E. (Personal Universal Library System for Eternity) is presented as a print advertising campaign for a fictional product that offers its subscribers a variety of ways to preserve and access their personal libraries. The advertising campaign adopts a sleek corporate design and savvy, motivational slogan: “Read. Search. Organize. Share. Your books. Anywhere. Anytime.” In place of fear-mongering language, PULSE employs images that invoke catastrophe: a nuclear cloud, an underground bunker, a book in flames, a spaceship escaping an apocalyptic Earth surging to a new frontier. Emilio Chapela Pérez generates his artist statement by a computer. He lives and works both in Mexico City and the Forgotten Realms of the Earth. His artistic practice is concerned with the development of a system that allows the operator to control various processes such as those used for conventional and unconventional methods to determine the relative importance of individualized factors. He has participated in shows at places like the U.S. Geological Society of America and at the Museum of Modern Art in New York. In 2010, he published his first book on the history of the world. Pérez has two pieces in the exhibit. According to Google (2008) is a collection of image encyclopedias, each of which contain images returned from a Google search of their titles –1968, Border/Frontera, Capitalism, United States, etc. –serving as an immediately outdated compendium of images collected from the time he conducted the search. According to Google amplifies the extent to which combinations of image and language can both enhance and confuse understanding. 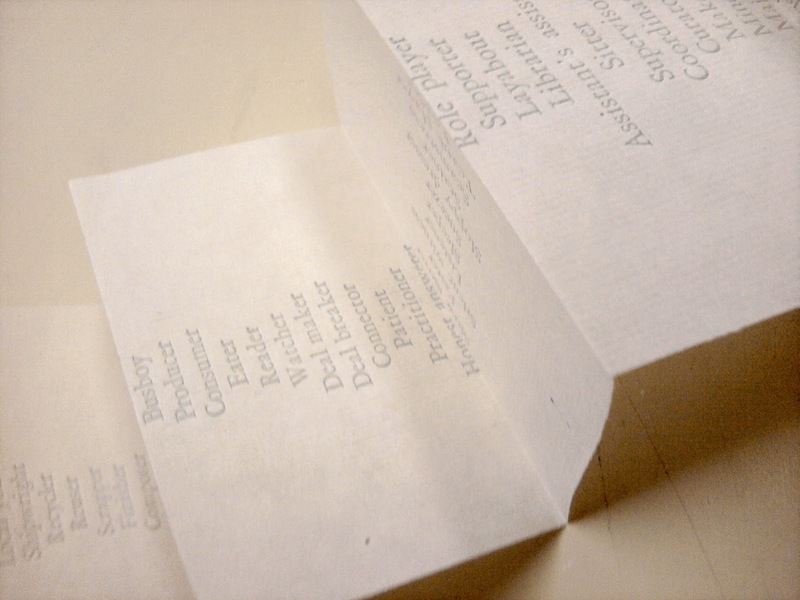 In A book…(2012), a computerized text-to-speech voice reads a set of concatenated Wikipedia entries, beginning with the entry for the “book.” Using the last word of a line as the first word of the next line, A book… returns language to an acoustic space (albeit an artificial one), employing the chain verse technique used by medieval English town criers who brought news to a mainly illiterate populace through spoken word. Lisa Schilling was born and raised in a small town in Northern California where a brush with violent crime and community scandal in the mid-80’s made a deep impression. Lisa worked in the film industry in Los Angeles in her late teens and early 20’s, building sets and mixing large quantities of fake blood for horror films, after which she attended art school at California College of Ars and Crafts in Oakland, CA (now California College of Arts) and Maryland Institute College of Arts in Baltimore, MD. Lisa lives and works in Brooklyn, NY. The House By The Sea: A Model (2014) is a visual interpretation of two texts: F. Scott Fitzgerald’s unfinished and posthumously published novel The Love of the Last Tycoon, and May Sarton’s journal, The House by the Sea, in which the “spell of the sea” acts as muse. 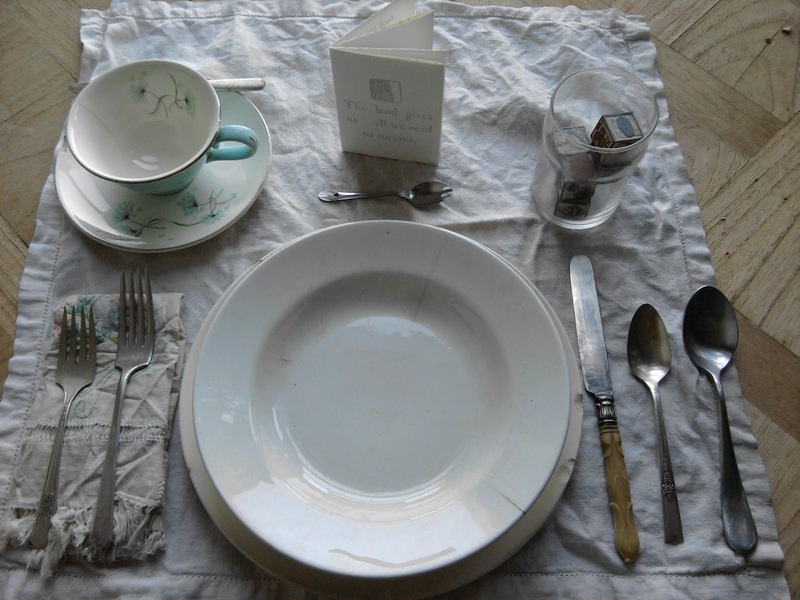 Suggesting a physical enactment in theater or film underscored by the theme of creativity, House by the Sea: Model is both muse to and vessel of the story, speaking to how objects can record, hold and reveal embedded narratives. Jennifer Tobias is the Reader Services Librarian at the Museum of Modern Art. She is a graduate of the City University of New York’s Art History program. Her 2012 doctoral dissertation is The Museum of Modern Art’s What is Modern? Series, 1938-1969. Once Upon a Time, There was the End is curated by Rachel Gugelberger. See Diane Stemper’s Artist Talk on May 30th! 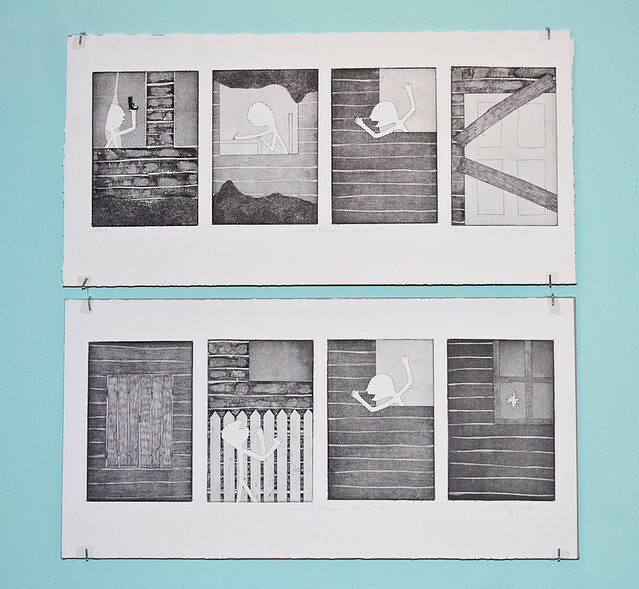 Come see Diane Stemper, and her Featured Artist Project: Sample Close at Hand at the Center for Book Arts tonight: Friday, May 30th, at 6:30pm. The works in Sample Close at Hand reference Darwin, medical collections, and biological studies, codified in a series of prints and artist books, and books built into petri dishes. Stemper uses mixed media and combines linoleum prints; archival inkjet prints; found and altered text; colored pencil; pen & ink drawing; maps and actual natural materials relevant to the content of the books. Sample Close at Hand is currently on exhibit at the Center until June 28. Diane Stemper received her B.F.A. in printmaking from the San Francisco Art Institute and a M.A. in Interdisciplinary Arts from San Francisco State University. Most recently, Stemper displayed her petri dish book series “Darwin’s Darlings” along with charcoal and pen & ink drawings in the Main Gallery of the Oxford Community Arts Center and at the Ohio Art League in Columbus Ohio. “Compendium” a series of petri dishes constructed by the artist and by gallery visitors was on display as a Short Show at the Dayton Visual Arts Center in 2009. Her work is included in the Artists’ Book Collections of: DAAP Library, University of Cincinnati, Ohio; Main Public Library of Cincinnati and Hamilton County, Cincinnati, Ohio; Special Collections, Miami University, Oxford, Ohio; and the Lucille Little Fine Arts Library, University of Kentucky. Learn more about Diane and her works at her website. Suggested donations for the talk are $10 for non-members; $5 for CBA members. Remember the shock you received in first grade when you learned that paper comes from trees, which meant that your homework notebook was directly responsible for the destruction of the rainforest?! Yeah, it was a big deal. In fact, while most commercial paper is made from wood pulp, paper can be made from a variety of materials, including wood pulp, cotton, and other textiles and plants. In fact, some of the first known paper was made with mulberry, discarded fish nets, and old hemp in 105 CE. Although reports differ on who exactly was the first to create paper, the invention and primary use is almost universally attributed to the Chinese. They first utilized paper for wrapping, before re-purposing the invention for writing, toilet paper, tea bags, currency, and a wide variety of uses. After papermaking techniques spread to the Islamic world, methods for mass production were developed and its use rapidly expanded across Asia and Europe. 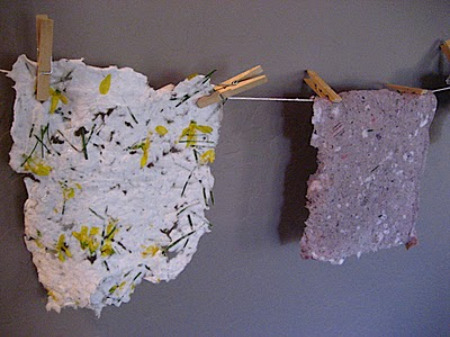 At essence, the process of papermaking involves soaking fibrous materials together in water. This substance is then placed onto a screen and spread out. The water and excess material falls through the screen, leaving a mat of fibers. The remaining water is pressed and dried out, creating a sheet of paper. The artistry is achieved through the use of different techniques and materials, which vary across cultures and practices. By learning the craft, artists can create unique and beautiful papers to use in their work or sell. 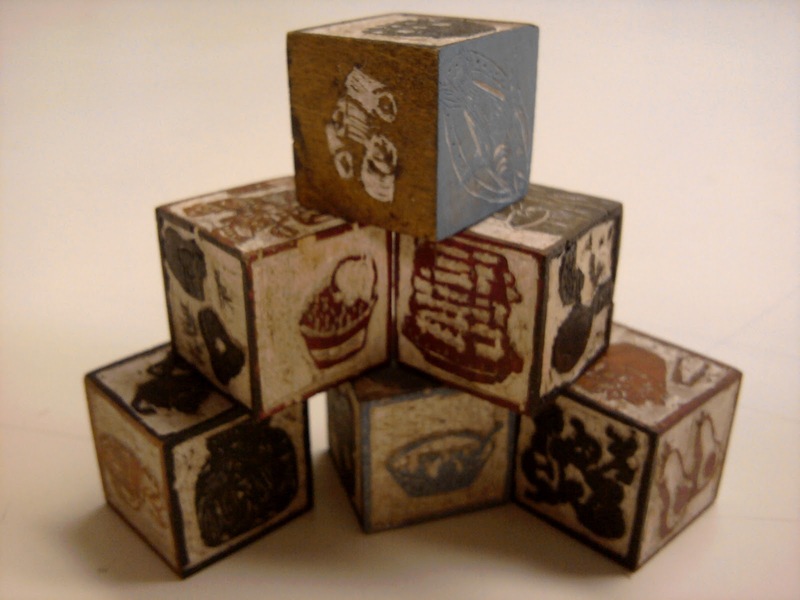 The Center for Book Arts will be hosting an artist talk and workshop, given and taught by Aimee Lee, one of the only American artists to have studied traditional Korean papermaking with Korean masters, while speaking in their own language. Korean papermaking, called Hanji, has been upheld as one of the very highest quality and sought after products. Hanji is created made from the inner bark of the paper mulberry tree, renowned for its long and strong fibers. This makes hanji ideal for an array of applications suitable for book and fiber arts, as well as renowned for its wide array of thickness, color, size, and translucency. Aimee Lee will be discussing this technique and her search to learn more about it, documented in her autobiographical book Hanji Unfurled, at an Artist Talk on Friday, February 22nd at 6:30. The workshop will take place on February 23rd and 24th. In addition to basic hanji techniques, students will learn joomchi, a felting method, and jiseung, a form of paper weaving, as well as other skills. Be sure to look for these exciting events amongst our wide array of exciting bookmaking and printing classes, when the winter course schedule is posted on the website later this week! 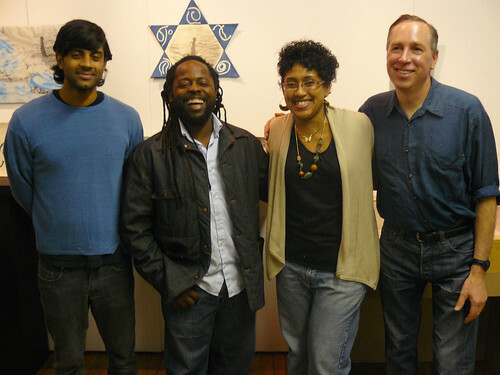 We’re really excited this week to present a talk with four of our five artists-in-residence from 2009; Terry Boddie, Gautam Kansara, Shani Peters and James Walsh will each present recent work related to their residencies here at the Center. Please join us on Wednesday, May 19th at 6:30pm for this stimulating discussion. Each year the Center invited five contemporary artists with no background in book arts to explore bookmaking using the resources and facilities at the Center. Artists are provided with a stipend, materials budget, workshops on bookmaking and unlimited access to the studios for a year. Residents this year worked on a wide range of projects: from sculptural experiments in the book form, to codex editions, books embedded with mp3-players, posters, prints and books with video. 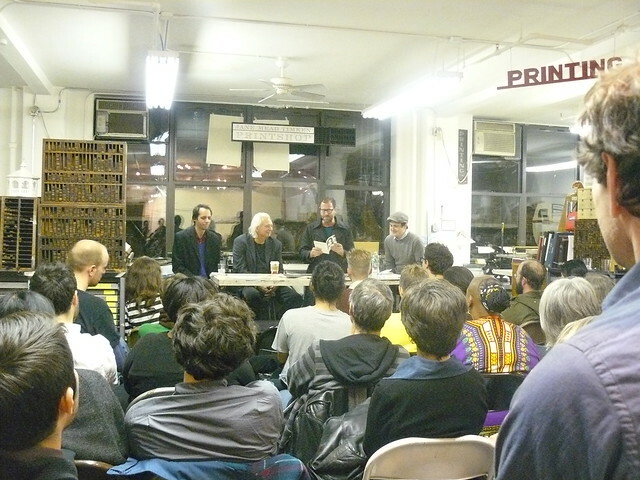 Our residency program is designed to promote experimentation in book arts, and to make buy modafinil fast shipping links between the traditional techniques that we teach and the contemporary role and practices of the artist. In this way, we all end up learning more about the ways books relate to other kinds of artistic productions. I like to think of the Center as a social hub for the various groups of people interested in making, looking at and talking about books and print culture, and inviting a new group of artists to come in and add their contribution to the mix of perspectives is one of the things that keeps the community alive in the studios. I hope you can join us on Wednesday; if not, you can check out the exhibition that’s currently up in our studio galleries of the work of all of our 2009 residents, which will be on view through June 26th.